This MQTT tutorial covers MQTT architecture, MQTT working operation and MQTT use cases including message flow. It mentions link to difference between MQTT, REST and HTTP. It is used in IoT wireless technologies such as zigbee, LoRaWAN etc. The figure-1 depicts MQTT architecture. As mentioned MQTT is broker based protocol. In this end devices (i.e. clients) communicate via broker. The broker is a server which can be installed on any machine in the cloud. There are different types of brokers such as HiveMQ, Mosquitto etc. The single client and broker can also communicate with each other. Following table mentions MQTT messages used between client and Broker. As MQTT runs above TCP/IP layer, it is also connection oriented protocol. The client establishes connection with the broker (i.e. server) before the communication. 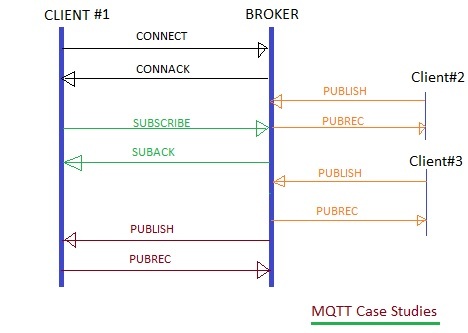 MQTT is a publish-subscribe protocol. Here both client and server publish about any information (i.e. parameter such as temperature, humidity, event (ON/OFF) etc.) to each other using "PUBLISH" message. Any number of clients or end devices can subscribe for event with the broker. Due to this subscription, when there is a change in any event or parameter, broker will intimate to the subscribed clients about the change in event or parameter (i.e. temperature, humidity etc.). CONNECT client to server (i.e. broker), client requests to connect with server. The figure-2 depicts MQTT message format. It consists of fixed message header, variable header and payload. The first two bytes are used by most of the message types. Few of the message types use variable header and payload. Let us understand working operation of MQTT protocol. 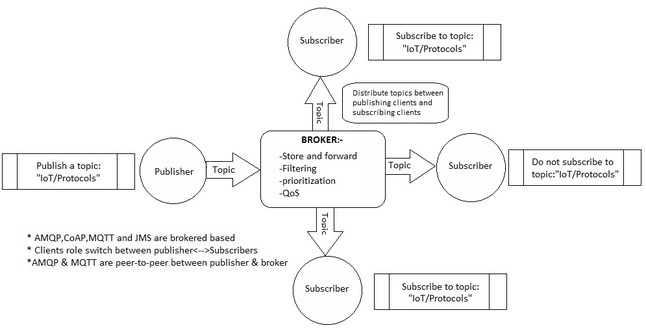 The figure-3 depicts MQTT message flow between client and broker. We will take two use cases to understand the same. ➨Initially connection is established by client#1 with broker using CONNECT and CONNACK messages. ➨Next Broker communicate with Client#1 to switch ON or OFF the light interfaced with it. The messages such as PUBLISH and PUBREC are used for it. This use case is used to switch ON/OFF the street lights in zigbee or LoRaWAN network. The lights are usually connected with end nodes or end devices in these wireless networks. The single Zigbee or LoRaWAN gateway controls multiple end nodes. Multiple such gateways are needed to cover entire city. ➨Client#2 and Client#3 will intimate temperature or humidity update to the broker using PUBLISH message. This information is stored in the database and will be sent to all the subscribers who have subscribed for these topics (i.e. temperature, humidity). These informations is "pushed" to all the subscribed clients of the topics. ➨If client#1 has already subscribed for subscription to topics (i.e. temperature, humidity), it will get the information from broker using PUSH operation.